The graying of America has contributed to the higher concentration of the elderly in certain areas of the United States. About 12% of Americans are over the age of 65. The elderly are concentrated in the Midwest and the South. The higher concentration of older people in certain places has economic ramifications. These areas are called upon to support a population that has a greater need for social services, such as healthcare. As the aging population rises in Pittsburgh, industries such as healthcare have replaced the steel industry due to the shift to a more elderly population in that area. pension: A gratuity paid regularly as a benefit due to a person in consideration of past services; notably to one retired from service, on account of retirement age, disability or similar cause; especially a regular stipend paid by a government to retired public officers, disabled soldiers; sometimes passed on to the heirs, or even specifically for them, as to the families of soldiers killed in service. According to the United States Census, about 12% of the American population is over the age of 65. However, the elderly are not evenly distributed throughout the United States. There are higher concentrations of the elderly in the Midwest and in the South, particularly in Florida. The high concentration of elderly in Florida is partially attributable to the fact that many retirees move to Florida for the good weather. In contrast, few elderly people move to the Midwest. Instead, the high concentration of elderly people in the Midwest is due to the fact that the young are moving out of there. 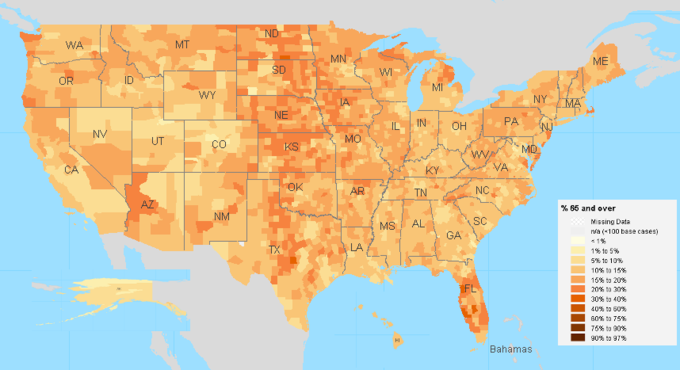 Percentage of the Population Aged 65+ in the United States: This is a map of the USA reflecting the percentage of the population over age 65 by census district based on Census 2000 data. The city of Pittsburgh offers an intriguing case study of the effects of an aging population on a city. Since 2008, more people die annually in Pittsburgh than are born. Further, many members of the younger generation are moving away from Pittsburgh in an effort to find work. As such, Pittsburgh is both experiencing population decline and the aging of its existing population. This poses an economic conundrum in that the population is increasingly reliant on public services for assistance, such as healthcare, but there is a smaller workforce that can be taxed to support the demand. Additionally, changing demographics have influenced the comparative prominence of different economic sectors in Pittsburgh. Healthcare has replaced steel as Pittsburgh’s largest industry. This case study demonstrates how shifting population demographics can seriously impact an urban area’s economy. While the effects of an increasingly aging population on society are complex, there is a specific concern about the impact on healthcare demand. Older people generally incur more health-related costs than do younger people, and in the workplace can also cost more in worker’s compensation and pension liabilities.